Shine a Light: I Love a Festival!!! Street performers in Cygnet ... rousing drums and great dancers. Everyone driven to move with the beat!! All the sounds, scenes and atmosphere at the Cygnet Folk Festival meant I had one big smile on my face for the whole day we were in town. All the ticketed performances were sold out way before we were even aware the Festival existed, but that didn't matter ... the performers on the street more than made up for anything in the halls we may have missed! 'Southern Belle' made the trip around to the Port of Cygnet with ease. 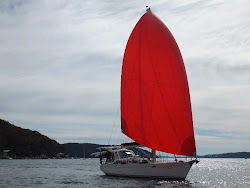 George and I just pointed her in the right direction, turned on the autopilot and motor sailed for the couple of hours needed to move from our overnight mooring in Great Bay. The day was another exceptional one - Tasmania in all its natural splendour again - with light winds and plenty of sun. As we travelled across another large expanse of perfect water and beautiful scenery George and I commented on the absolute lack of other people or boats .. as far as the eye could see there were only 2 other boats. If this was Pittwater (our home port) on a Friday in early January there would be power boats, sail boats, ski boats, jetskis and all other manner of marine craft. But here ... nothing. Just wide open spaces. Another reason to love, love, love Tasmania! We arrived at the Port in the early afternoon and motored around the already moored/anchored boats to find a space to drop our anchor. The "Port" of Cygnet was, at one time, a major shipping bay for the produce of this area. Today it is just the end of the bay ... a place to drop anchor or pick up a mooring and then go ashore at the little Port Cygnet Sailing Club, leave the dingy and make the 2km walk into town. As we were lining ourselves up to anchor we drove around the back of a lovely yacht sporting an American flag ... we wondered who they were and if they had sailed it all the way here from the USA. It wasn't long until we met them. While doing the odds and ends required to straighten up from our day's leisurely cruise I heard a shout and a dingy approaching. It was the couple off the American boat coming to invite us for "Sundowner Drinks" at 5!!! I've said it before, this is the part I like about cruising the most! Meeting new and interesting people. It turned out they were on the lookout for us .. Peter & Sue on Celay had met and socialised with them in Eden while waiting to cross Bass Strait and they are also well known to our good friends Bruce and Thelma!! This cruising world is a very small and connected. That night we joined them on their boat along with another cruising couple we had met in Airlie Beach in 2013 ... another night of laughs, stories and good times. Everyone was here for the Folk Festival. Main street of Cygnet for the Festival. Free music in the park with a different performer every 30 minutes. The best thing about sitting in the park - other than the music - was people watching! There were all kinds of people from everywhere - young, old, bikers, hipsters, hippies - complete entertainment. One of the street bands .. these guys were great! We just happened to be walking past the town hall where we could hear fantastic drumming going on inside .. then, all of a sudden, the performers burst through the doors banging away with their whole audience streaming out behind .. all dancing!!! You just had to follow them on to the main street! They had everyone dancing. Just some of the performers leading the crowd at the Sailing Club in the sing-a-long of Sea Shanties. After saying goodbye to the people we had met the previous night and during the day we made it back to the boat and pretty much collapsed. It was a big enjoyable day at the Cygnet Folk Festival .. just one more thing that should be everyone's itinerary when visiting down here!! The next morning we pulled up the anchor and moved further up the Huon River. We had a great sail for the 3 or so hours it took to get to the last anchorage available to our boat. The rest of the river, while still wide, can be shallow so we'll stop here. Our friends from Lake Macquarie - Bruce and Thelma - live in the little Port Huon Marina on their boat. We anchored off last night due to the tide and George went to get them in the dingy for drinks and dinner aboard Southern Belle. Tonight we're joining them for a dinner at the Wooden Boat Shed up the road in Franklin. Thought you might like Cygnet. Before entering Cygnet from the east, Egg and Bacon is worth a night's stop. As is Copper Alley inlet on the west side as you enter Cygnet. Our favorite at the bottom of the Channel is Dover. And Recherche Bay at the bottom is beautiful forests with the chance to day walk to the south coast. Absolutely agree its a must visit festival, glad you had a good time there Gail. Couldn't get there this year but 2014's was a blast! Jack is on the money with those anchorages but would like to add another favourite of mine....Randals Bay is well protected, (West through to East) and a pretty bay with good fishing if you are on the way to Cygnet or coming back. There is a public mooring on the Western end that is the prime spot if you are early enough or lucky.